Image by Flickr user neckandback. 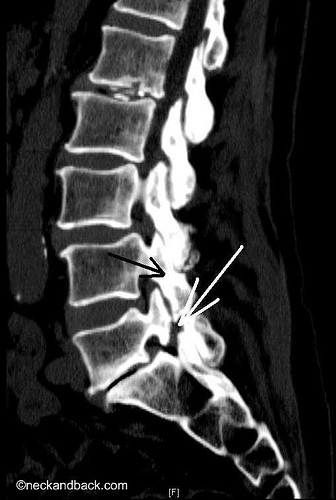 In 2001, after a history of throwing my back out, I was diagnosed with 2 herniated discs. I had endured long periods where I couldn’t move or perform the tasks of daily life for a few days or even weeks. But in 2001, it became worse than ever. The pain was constant and I couldn’t find relief with any activity. Moving hurt, but so did resting. I couldn’t lie on the table long enough to get a massage. I thought chiropractic care would help, but after some sessions, I was in too much pain to even get into my car. My husband had to tie my shoes for me, he had to bring in the groceries and change the cat litter, shovel the walk, weed the garden, and anything else that required lifting, carrying or bending. I had just started practicing yoga at Bikram Yoga Burlington, Vermont, when the pain became really acute. I called the studio and asked what I should do. My teacher, Aimee, told me I could take a couple of days off if I really felt I needed it, but to get back in the studio before a week had gone by. I visited a spine doctor that week and got my diagnosis. “Cortizone shots, pain killers and surgery,” he explained, were my only options for pain management. Notice that I didn’t say “rehabilitation.” He had nothing to offer long term; no way to heal or rehabilitate the area. Instead he offered a way to just cut out the bulge and take drugs so that I couldn’t feel it. I knew there had to be another option, a better option. The yoga had been making me feel great in so many other ways, that I decided to trust the process. I listened to my teachers. I practiced almost every day for over a year. In my poses, I worked on creating traction for my spine to take the pressure off the compromised discs. I limited or skipped forward bends all together. I worked to deepen my backbends in order to improve my spinal alignment and to develop soft tissue strength to support the weakness in my inter-vertebral discs. I shed a lot of tears on my mat in that hot room. Tears from the pain. Tears because I felt sorry for myself. Tears because it was hard and sometimes I felt hopeless. When you are in the depths of that kind of pain, it is hard to see that there might be a relief someday. When everything hurts, from brushing your teeth to sleeping, it is hard to imagine that your life won’t always be focused on your pain, even in your sleep. There were many days that I pulled into the parking lot, drove around the back of the building and right out the other entrance. Sometimes I did that circle three or four times before I would park my car and drag my aching back through the doors of my yoga studio. Many of my classes were very painful, but I always felt worse if I didn’t go to class. My biggest breakthrough came when I took a class with Rajashree Choudhury in Los Angeles at Bikram Yoga International Headquarters. I wanted to speak with her before class to give her a disclaimer about my back and to ask her for any help or modifications. There was a long line of students waiting to speak with her, so I never got my chance. Before she started the class she told us that many students had asked her about modifications for back pain, “Just do your yoga,” she told us. And I did. Within 11 days, I was pain-free and terrified. I was terrified that it wouldn’t stick, that the pain would come back, or that I would do something to hurt myself again. I still face that fear some days.Thankfully the days are now few and far between, but it does come up from time to time. Each time it does, I get better at dealing with it. I tell myself that moving my body is not going to damage it. I remind myself that I have learned to heal myself with yoga before and that I have the tools to do it again. This entry was posted in Physical Healing, The Yoga of Life and tagged back pain, Bikram Yoga, Bikram Yoga Portsmouth, exercise, fitness, health, herniated disc, inspiration, life, Sara Curry, spine, The Yoga Diaries, yoga by The Yoga Diaries. Bookmark the permalink. Beautiful reminder of what the yoga is for- healing both the body and the fear created in the mind. I struggle with it every class, but that’s why I go as often as I can. You are a gifted teacher and an inspiration. Hi Sara~ I just read your post and was immediately struck by the fear and the hope in your story. I hurt my back in 2005 as a Labor and Delivery nurse. I was told to “do yoga because it will cure you”. I did it without understanding the poses that could increase the damage and the pain, instead of concentrating on the poses that could help. Now I do Gary Kraftsow’s Viniyoga, and it IS helping 🙂 I read that you did “26 poses”….I would love to know what those poses are, exactly. Can you let all of us with lower back pain and bulging discs know what those magic poses are? I am so happy for you!!! !